Hypothyroidism is a condition in which thyroid gland does not produce sufficient thyroid hormones. This gland is located at the base of the neck. It is a small butterfly-shaped gland which produces hormones. These hormones are responsible for regulating many body functions and provide energy to the body. Lack of these thyroid hormones can result in slowing down of body’s functions. This condition usually affects women as compared to men. If hypothyroidism is left untreated, maltreated or undertreated, it can pose many problems like pain in joints, obesity, heart diseases, and infertility. What can be the Signs and Symptoms of Hypothyroidism? Stiffness and pain in joints. The weakness of memory and hoarseness of voice. Dry, coarse hair and skin. What can be the Causes of Hypothyroidism? Hashimoto’s disease- It is an autoimmune disease and is one of the most common causes of hypothyroidism. As in this disease, the thyroid gland is attacked resulting in its chronic inflammation which reduces the function of thyroid gland. This cause can affect more than one member of the family. Treatment for hyperthyroidism can also result in hypothyroidism. Hyperthyroidism treatment aims at lowering the level of thyroid hormone but this can result in its permanent lowering. If due to some thyroid problems, it is removed by surgery entirely. This can cause hypothyroidism. This is permanent damage and one have to take thyroid medication for rest of the life. Radiation therapy for cancer of head or neck can slow down the thyroid production. Certain medicines can also result in hypothyroidism. How can be Hypothyroidism Diagnosed? Physical examination and medical history will reveal the signs and symptoms. TSH, i.e. thyroid stimulating hormone tests. How can be Hypothyroidism Treated? In the modern practice of medicine lifelong synthetic thyroid hormone is given in the form of medications. There is no permanent treatment for it yet in the conventional system. What is the Ayurvedic understanding of Hypothyroidism? According to Ayurveda, ama which is a toxin or indigested substance gets attached to the thyroid gland. Immune cells of the body try to remove this ama from the body but during this, it also damages the healthy cells of the thyroid gland. This results in hypothyroidism. In Ayurveda, treatment of this disease is done by natural herbs in a very safe way. There is no side-effects and person can take these medicines for the long term. These natural remedies remove ama from the cells of thyroid gland without harming the healthy cells. Hence treating disease. 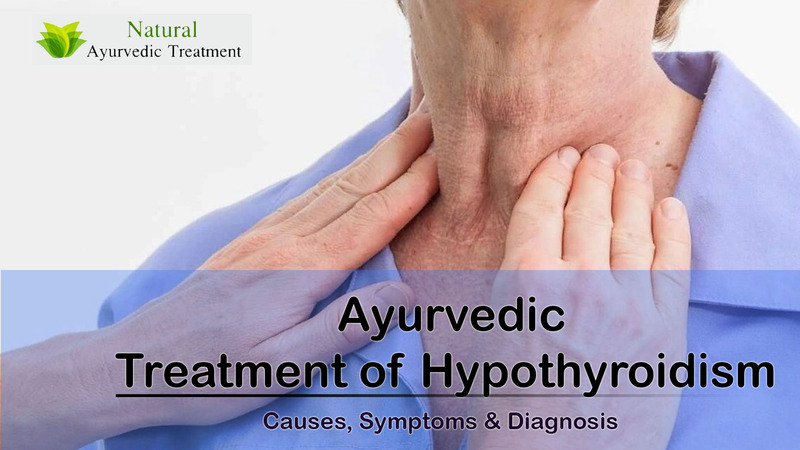 Planet Ayurveda offers hypothyroid care pack for treating Hypothyroidism. These products are completely safe and vegetarian. These remedies are not tested on animals. 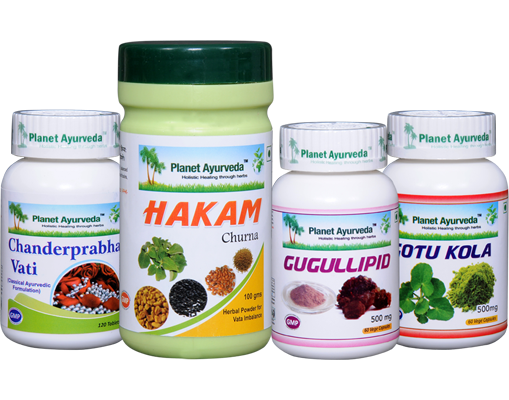 Any of the product of Planet Ayurveda does not contain chemical substances. It helps in relieving stress and calms the body. Inflammation of thyroid gland is relieved along with associated symptoms like pain, redness, and swelling. This improves gland functioning. These tablets help in losing weight and manages obesity. Stamina and strength are increased by its proper consumption. Chandraprabha vati increases liver function and improves overall health. Reproductive health in both males and females is improved by its regular consumption. Antibiotic activity of these tablets helps in preventing and treating infections. Dosage- take two tablets two times a day after 30 mins of the meals. Anti-inflammatory properties of this churna relieve inflammation of the gland and improve its functioning without causing any side-effects. Decreases the production of ama, i.e. toxin and improves functions of liver and digestion. It decreases obesity and blood cholesterol level. This churna also helps to treat health conditions like osteoarthritis, cervical spondylitis. Hakam churna improves normal digestion of the body. Dosage- Take 3-5 gm of powder with water (Hot) after 30 mins of the meals. It helps to treat obesity due to its fat burning properties and have rejuvenating effects. These capsules help to control blood cholesterol and triglycerides by its regular consumption. Antioxidant property of these capsules helps to prevent oxidization of cholesterol and also prevents hardening of arteries. Dosage- Take two capsules two times a day after 30 mins of the meals. 4. Gotu kola capsules- These are the single herbal capsules made from Centella asiatica(Gotu Kola). It is used to treat various medical conditions. It boosts memory and confidence. These capsules help to treat nervous exhaustion. Gotu kola capsules restore the vitality of the body. Stress and anxiety can be relieved by its proper intake. By the use of this herbal and natural care pack the level of Hypothrodism comes in level and the symptoms gets manged. 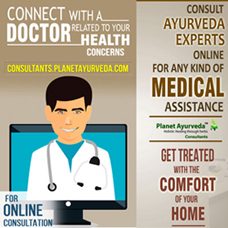 ← How to Treat Gastric Problems in Ayurveda?